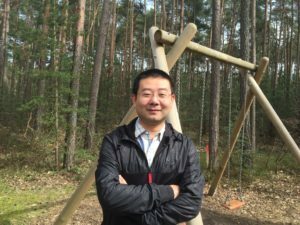 Dr. Duo Xu focuses his research interests on turbulent flows and transition to turbulence in shear flows using state-of-the-art experimental and numerical research tools. He obtained his PhD from Purdue University (West Lafayette, IN), USA, in December 2012, after having received his Master’s and Bachelor’s degrees from the Chinese Academy of Sciences and Beijing University of Aeronautics and Astronautics, China, in 2008 and 2005 respectively. After completing his PhD, he came to Germany for his postdoctoral research at the Max Planck Institute for Dynamics and Self-Organization, Göttingen. Since August 2014, he has been a Humboldt Postdoctoral Fellow at the Chair of Fluid Mechanics (FAU) studying the transition to turbulence in pulsation pipe flows in the group led by Prof. M. Avila (FAU) in collaboration with Prof. B. Hof (IST Austria). The strong engineering background at FAU is ideal for my research. Fluid mechanics influence many things, from mixing milk in coffee in our daily lives to high-end engineering applications such as designing the Airbus A380. In this field, turbulence, described by Nobel Laureate Richard Feynman as ‘the most important unsolved problem of classical physics’, remains a mystery which greatly attracts my curiosity. Prof. Avila’s group at FAU carries out high-quality research in the field of fluid mechanics, while the strong engineering background at FAU is ideal for my research. FAU has its strength in my field in the engineering applications and interdisciplinary research. In the university systems of China and the USA, PhD students need to take necessary courses to strengthen their knowledge, while PhD students here carry out their research directly with no further training, so that they can focus all their attention on the research. I think FAU has a closer connection to industry, and the collaboration is a scientific motor for German industry, especially for high-end manufacturing. In physiological flows the appearance of turbulence controls or increases the risk of disease, such as the formation of aneurysms in the cardiovascular system. Studying the process of transition from laminar (ordered) to turbulent (disordered) flows improves our understanding of this bio-complexity issue from the point of view of fluid mechanics. In my project I identify the characteristics of the physical process of the transition to turbulence in pulsatile pipe flows, which is a prototype of physiological flows. I find that the pulsation frequency and pulsation amplitudes both affect the transition to turbulence in the flows, while the influences of these two effects are different in different parameter regimes. My research will improve our understanding of the features of the onset of turbulence in pulsation flows or time-dependent flows in general. This is of importance in identifying the formation conditions of certain diseases in the field of medicine, and saving energy in engineering applications through reducing drag by preventing flows from reaching the turbulent state. Walking in the forest often gives me inspiration for my research. The city of Erlangen has a mixture of a historic and modern atmosphere, for example with the coexistence of the old town and Siemens. I think that the highlights will probably be clearer to me when I look back on my time here while I prepare to leave. The forest is my favourite place and walking in the forest often gives me inspiration for my research. This postdoctoral experience will definitely benefit my academic career and I appreciate the Humboldt Foundation for offering me this valuable opportunity. I also would like to thank FAU and especially my colleagues in Prof. Avila’s group for hosting me here.